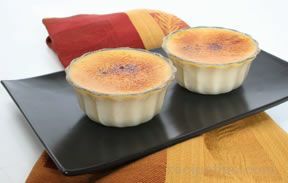 Creme Brulee means "burnt cream." 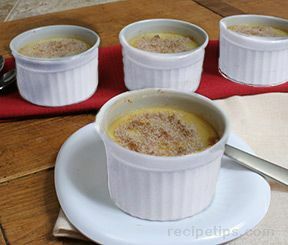 This creamy custard with its crisp, caramelized sugar topping is a dessert worthy of any occasion. 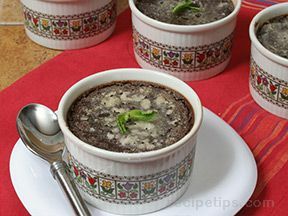 Search the site for more Creme Brulee recipes and information on How to Make Creme Brulee. In a mixing bowl, beat egg yolks until slightly thickened. Gradually stir in sugar and salt. Heat the cream in a saucepan over medium heat. Remove from heat before cream comes to a boil. Slowly stir into egg mixture. Add vanilla. 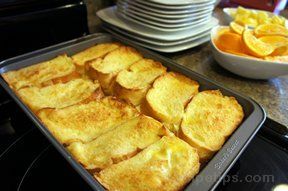 Divide the mixture into 4 ramekins and place them in a baking pan. Fill the pan with water about half way up the ramekins to make a water bath. Bake for 45-60 minutes until firm. Remove from oven and allow to cool. Sprinkle the top with sugar and carmelize with a kitchen torch. Garnish with raspberries or strawberries. Tip: Brown sugar may be substituted for the granulated sugar, but you may want to increase the amount to 1 tablespoon per serving.